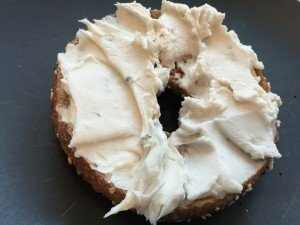 Cream cheese is one of those foods that is really hard to replicate, and I finally found a cream cheese I like in Daiya’s Chive & Onion. 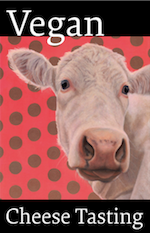 Then I heard that Trader Joe’s has a vegan cream cheese. 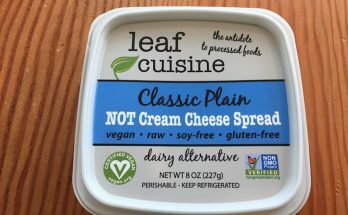 This TJ’s version was recommended by a friend who doesn’t like Daiya and hadn’t found a palatable cream cheese until this one. So, I was very eager to try it. 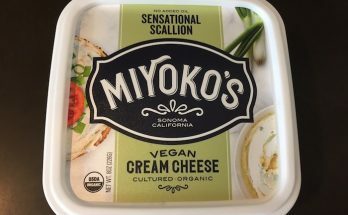 The texture is quite good — softer than you might expect of “real” cream cheese — and the flavor is wonderful: very creamy, with none of the tang that Daiya has (which made the plain style too sweet for me). 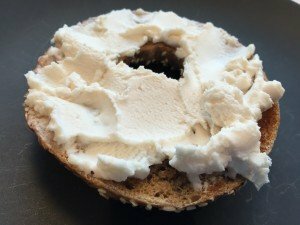 So this is a much mellower, milder cream cheese. 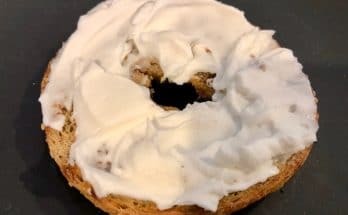 Because the texture isn’t as smooth, I made my bagel with half Daiya and half Trader Joe’s — and while I like the smoother and thicker Daiya texture more, I prefer the Trader Joe’s flavor. So…I will probably continue to enjoy both (though maybe not half and half every time). 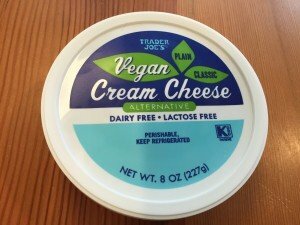 Whatever your vegan cream cheese preference is at the moment, it’s well worth checking out the Trader Joe’s version — it’s among the best around!